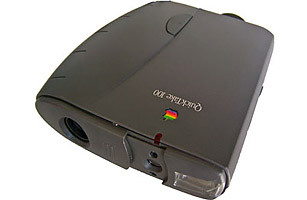 Built by Kodak, the QuickTake 100 was the first consumer digital camera and was released in 1994. It worked only with the Apple Macintosh and could take between eight and 32 photos, depending on resolution  pretty good at the time. There was no autofocus or zoom, but it did have a built-in flash and digital display.